The history of this pure natural spring water goes back through many years of intriguing public interest and changing commercial fortunes. 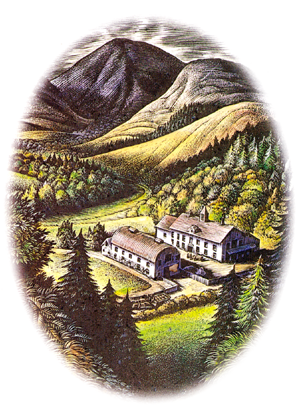 The Cwm Dale Spring has always been known for its remarkable low mineral water content. The catchment area for this celebrated spring is the Long Mynd, a protected area of natural beauty in Shropshire, with the spring itself being found on the outskirts of the small town of Church Stretton. Pictures above: the bottling works, public tap and site of the spring in 2012. It was probably the supply of pure, fresh water which was the main reason for people establishing their homes here many years ago. The town of 'Stretune' has grown from a handful of Saxon dwellings to become the Town of Church Stretton as we know it today. The name Stretton (or Stretune) meant a farmstead or settlement by the street. In this case the street was the Roman road, which runs from Wroxeth to Leintwardine and beyond - part of which is now the A49. Among the oldest documented evidence of Church Stretton are the charters for the market and annual fair, granted by King John in 1214. Since this time, Stretton has been a service town for its immediate area. Although the waters were utilised by the local inhabitants and much praised for their purity by visitors for centuries, the first mention of any commercial exploitation of the local spring water was 1881. 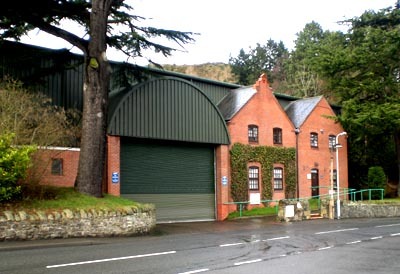 The Church Stretton Aerated Water Company opened in the Carding Mill using waters drawn from the nearby Long Mynd Spring. 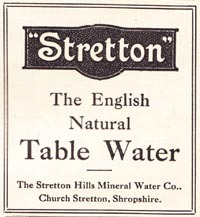 Undoubtedly this company achieved a degree of success, but it was rapidly overhauled by the Stretton Hills Mineral Water Company, which opened a purpose-built factory on the Shrewsbury Road in 1883. This bottling works was, and is still, located at the mouth of the Cwm (or Cound) Dale and is the basis of today's flourishing local industry. For a while both aerated water companies existed quite happily alongside each other. Entries for both companies appear in Kelly's Directory of 1885. 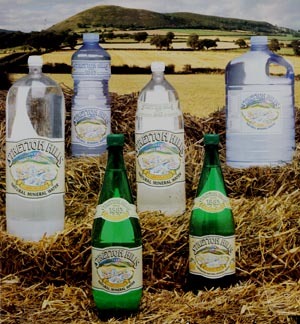 The Church Stretton Aerated Water Company was noted as manufacturers of Soda, Lithia and Potassium Waters, Ginger Ale and Lemonade etc. and described themselves as 'sole lessees of the Long Mynd Spring, the purest water in England, containing only 4 grains of solid matter in a gallon before filtration'. The Stretton Hills Company has a more succinct claim - 'Soda Water and Lemonade etc. manufactured at Cwm Dale Spring'. A later entry in Kelly's indicates diversification into 'woollens, rugs and aerated waters' for the Carding Mill, but an enhanced reputation for the aerated waters of the Stretton Hills Co. Indeed Francis Sutton F.C.S., F.I.C., an eminent analytical chemist of the day, passed very favourable comments about the quality of Cwm Dale water, which were recorded on a stone tablet that is still proudly displayed outside the bottling works to this day. Queen Victoria herself was believed to have been so impressed with the quality of the water that she decreed that the governors of our colonies should all enjoy a regular supply of Stretton water. Cwm Dale water was subsequently shipped to all corners of the world. 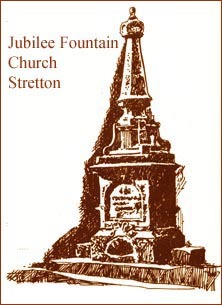 The town of Stretton responded by commemorating Queen Victoria's Jubilee with the erection of an ornate drinking fountain on the site where the Midland bank subsequently stood. The latter days of the Victorian era saw the stature of the Cwm Dale Spring waters grow considerably. Advertisements of the day emphasised the purity of the town's water supply and the effectiveness of the air, which together were specially recommended for 'the treatment of neurasthenia, for the baneful affects of influenza, for sleeplessness, for delicate children, for convalescence after illness, for anaemia and general debility, for some forms of gout and rheumatism, for chronic bronchitis, for catarrh, for weak digestion, sluggishness of the liver, obesity and for the most elderly and semi-invalid people.' Almost a century later, however, the claims stress the purity and its application for a low sodium diet. Throughout the years many efforts have been made to turn Church Stretton into a spa town, but with little success. The vision seemed on the point of realisation in 1884 when the local Shrewsbury and Hereford Railway was transformed into the main line from South Wales and the West Country to Merseyside, Manchester, Leeds and Scotland by virtue of the advent of the Severn Tunnel. This event offered infinitely better communication possibilities to the town of Stretton and convinced the Reverend Holland Sandford (Rector of nearby Eaton-under-Heywood) that the time had come for Stretton to take its rightful place as a famous 19th century spa town. Sandford Avenue came into existence when the enthusiastic rector had an avenue of lime trees planted in the town in an effort to recreate the beautiful tree-lined avenues he had seen on the Continent. However, all the plans floundered and Stretton never became the s pa t own of his dreams. Stretton did boast a Hydropathic Establishment, opened in 1900 and offering treatments that made a welcome alternative to drugs or surgery. Hydrotherapy was originated in Austria by Vincent Priessnitz and was popularised in England by doctors such as Wilson and Gully from Great Malvern. The treatments determined that patients underwent such activities as being deluged by ice-cold water from a great height or being wrapped in wet linen sheets. This was coupled with a strict diet, abstinence and plenty of exercise. Charles Darwin, Florence Nightingale and many more underwent the treatment in Malvern Spa. Picture right - Advertisement from Punch Magazine 3 Oct. 1917. While these events were taking place the mineral water company at Carding Mill went out of business - no mention is made after 1906 and the mill itself was demolished six years later. The Stretton Hills Company meanwhile had been acquired by Jewsbury and Brown Limited and the reputation of its Cwm Dale waters grew through the years to become unquestionably the finest in the land. Their advertising during the Coronation year of 1953 made the point that the company had existed during five reigns, in which time they had held Royal Warrants of Appointment for several monarchs. They also had the distinction of reproducing a portrait of Her Majesty Queen Elizabeth, the Queen Mother, as part of their advertising campaign. This charming painting, by David Jagger, was much admired by Her Majesty, as her personal message on the back of the original painting indicates. The picture used in advertising is shown alongside. 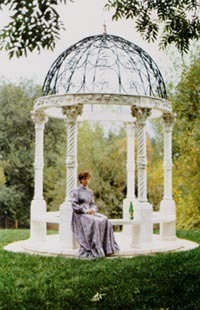 During the 1980s. the waters from the Cwm Dale Spring were still collected in much the same way as they were in Victorian times. The spring itself is a shallow depression into which a storage reservoir has been constructed, built of glazed brick with a reinforced roof and a brick base. The spring water wells up from the bottom of the reservoir, through the natural underlying rocks, and is piped directly to the bottling plant. Any excess water is automatically channelled to waste through an overflow pipe. The above is based on an orginal text prepared by local historian David Bilby in the 1980s and edited by Dr Bruce Osborne. 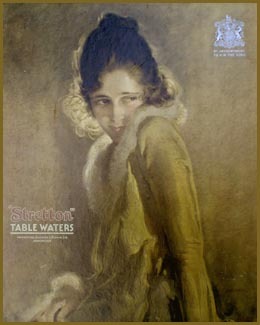 Picture above - This model for this early advertisement for Stretton Table Waters was Elizabeth Bowes-Lyon, later the Queen and subsequently H.M. the Queen Mother. Beneath the Royal coat af arms it reads "BY APPOINTMENT TO H.M. THE KING". Mineral Water from the celebrated Cwm Dale Spring at Church Stretton, Shropshire, has long been known for its remarkable low mineral content, having been naturally filtered by the pre-Cambrian rock strata which was laid down approximately 850 million years ago before life in abundance appeared on earth. Left - A selection of branded bottles from the 1980s. 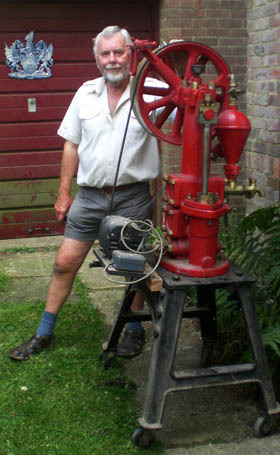 Left - The Stretton Water Pump - rescued from the works scrapheap by Bruce Osborne. 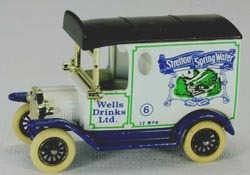 Below - Stretton Water delivered by model van. 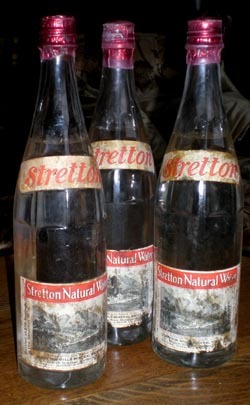 Stretton Mineral Water label from the 1980s. 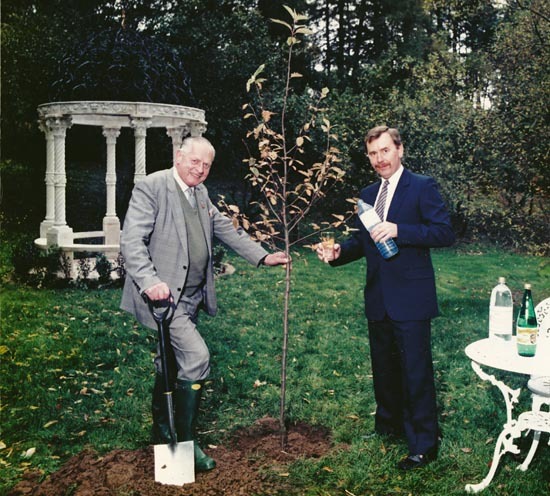 Above - Percy Thrower - gardening and tv celebrity plants the Stretton tree near the spring accompanied by Bruce Osborne - Marketing Director. For further information on the Waters of Church Stretton contact Dr Bruce Osborne by clicking email above.